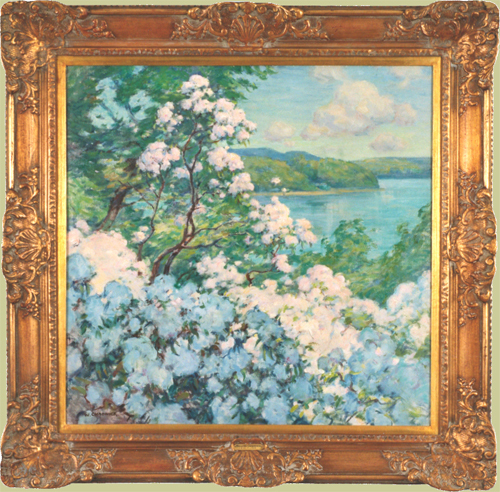 An American Impressionist, Chadwick was a member of Old Lyme art colony and painted with Childe Hassam, Charles Ebert, and Chauncey Ryder. He painted on Monhegan Island, ME. His studio was reconstructed on the grounds of the Florence Griswold Museum.Born/lived: England/Old Lyme, CT.Studied: ASL with Twachtman, H Siddons Mobray, George Bridgman, Kenyon Cox.Member: Salmagundi Club.Exhibited: Pennsylvania Academy of the Fine Arts; National Academy of Design; Corcoran Gallery; Art Institute of Chicago; Lyme Art Assoc; Lyme Art Assoc; Florence Grisswold Museum, Old Lyme, CT.
Materials oil on canvas. This painting is in excellent condition.